1 day Trip to L. Naivasha Safari. 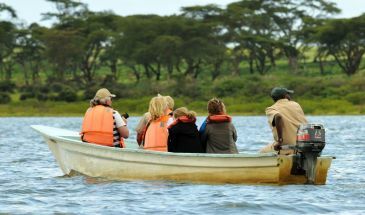 Lake Naivasha full day trip safari from Nairobi takes you to Lake Naivasha the second largest freshwater lake in Kenya which is approximately 100 Kilometers from Nairobi and a 2 hour drive away. Lake Naivasha is located north west of Nairobi, outside the town of Naivasha. It is part of the Great Rift Valley. Lake Naivasha full day trip safari departs Nairobi after breakfast and the journey takes you northwest of the city of Nairobi to the Great Rift Valley Floor. Along the way you make a special stop at a viewpoint to enjoy views of the Great Rift Valley Escarpment. Once in Lake Naivasha we proceed to Elsmere Lodge; the original home of Joy Adams of Born Free fame for high tea. Elsamere lodge or Camp is a haven for lovers of nature, set in Acacia forest on the banks of Lake Naivasha in Kenya’s Rift Valley. It is the former home of the late Joy Adamson who, together with her husband George Adamson, became world famous for their pioneering conservation work and relationship with the lioness Elsa, as told in her bestselling book and subsequent film, ‘Born Free’ and she did much of her writing at Elsamere up until her murder in 1980.Her relationship with Elsa the lioness who she raised from a young cub and later successfully released back into the wild. After the visit we proceed for lunch at one of the lodges located on the shores of Lake Naivasha. Early afternoon we take a boat ride on Lake Naivasha. This is a beautiful freshwater lake, fringed by thick papyrus is almost 13 km's across, but its waters are shallow with an average depth of five meters. The waters of the lake draw a great range of game to these shores. Giraffes wander among the acacia, Buffalo wallow in the swamps and Colobus monkeys call from the treetops while the Lakes large hippo populations sleep the day out in the shallows. Our next discovery takes us to Crescent Island Conservancy. The terrain is flat, making it easy for walkers of all abilities to enjoy themselves. There is a lot of easy to see game e.g. giraffes, waterbucks, elands, wildebeests, zebras and impalas. It is also a heaven for birds with +200 species recorded. The lake has a lot of hippos, which you can easily spot from the island. Among the resident birds are fish eagles, ospreys, lily-trotters, black crakes and a variety of herons. Hippos also live in the lake. A number of mammals can be seen grazing in the surrounding lake environs, such as zebra, impala, buffalo, giraffe, Kongoni and, at night, hippos. We return back to Nairobi in the evening. • All applicable taxes & government tax .